"The Mary Lou Bingham Award"
As a way of introduction to those who are a new interpreter, a young interpreter, or an interpreter just recently moved to Alabama, you might not recognize the name Mary Lou Bingham. For many interpreters she has been a colleague, a friend, and a mentor. In 1973, she was the first interpreter in Alabama to receive national certification from the Registry of Interpreters for the Deaf (RID) – Comprehensive Skills Certificate (CSC). Mary Lou, “Mama Lou” as she is fondly called, was born on May 4, 1916, in Midfield, Alabama, near Birmingham. Her parents were Leroy and Mary (Batson) Canoles. They attended Alabama School for the Deaf in Talladega. Mama Lou remembers that she began interpreting when she was 10 years old at a gathering with her parents and other deaf people. Over 75 years of interpreting experiences! She began interpreting in church when she was 14 years old. Mama Lou’s philosophy on the interpreting profession: “To communicate with the deaf, learn their language and communicate in ASL at the level they are most comfortable. Please learn their culture, be a friend, and don’t be too professional!” Mama Lou has been published in the RID Views many times. Check out the issues for July 1998 and August/September 1998 for very informative articles written by her. At eighty-two years old she was still “sharp as a tack”. In 1996, ALRID printed and sold the book, Mary Lou Bingham, Memories-Alabama RID. Well, once again there is a desire for more copies of this interesting collection of ALRID history as it was being made by many of the folks you know or have heard their names mentioned repeatedly. The book has letters, articles, pictures, logos, newsletters, and even a copy of the first bylaws for ALRID. In doing research for this article, I, Mary Ann Hickman, found that the original ALRID bylaws: Article XVIII- Awards stated "The ALRID Award for outstanding service to the Alabama Chapter of the Registry of Interpreters for the Deaf will be presented biennially, provided a qualified recipient can be named…. The award will be in the from of a framed certificate. A letter, a copy of which will be placed in the permanent Chapter files, will accompany this award. It recognizes major contributions to ALRID’s growth, interpreting programs, and administrative functions". 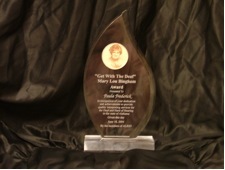 In 2004 the Mary Lou Bingham award has been changed once again from a plaque to crystal flame and includes an image of Mama Lou and her famous quote of "get with the deaf!". Mary Louisa Canoles Bingham, one of the earliest contributors to deaf ministry December work in Alabama, died Decemeber 28, 2009. She was 93. Mary Lou was a pioneer of Baptist church ministry to the deaf in the state, according to David Richardson, a retired missionary to the deaf in Alabama. Mary Lou, who was raised by deaf parents and began interpreting at the age of 3, began her first deaf ministry in the late 1940s at Glen Addie Baptist Church, Anniston. She later interpreted for the deaf in other Alabama Baptist churches, including First Baptist Church, Birmingham, and Central Park Baptist Church, Birmingham. In addition to church ministry, Bingham served as a houseparent at schools for the deaf in Alabama, Florida, New Mexico and North Carolina and a teacher at E.H. Gentry Technical Facility, a part of the Alabama Institute for Deaf and Blind in Talladega.